Having owned this phone now for a bout 5 months I thought it would be a good idea to tell you what I think about the phone. The HTC Desire mobile phone is an Android based Smartphone. Now usually when I get my hands on a new mobile phone I become very bored of it in a fairly short time period, the HTC desire however continues to astound me almost every day. So why is the HTC Desire so good? Apart from anything stupid like “can it make the Tea?” I am actually struggling to find something it can’t do, even with the faults listed below I still think it is the best mobile phone I have ever owned and nothing appears to match it for features. Ok previous phones allowed you to change the wallpaper and maybe add one or two tiny java applications to the main screen but one thing that really amazed me with the Desire was the fact that you can fully customise the display screen to show almost anything you want, and there are no less than 5 fully customisable screens to play with, all easily accessible by scrolling the screen to the left or right with your finger. Touch screen technology is not new and a few previous phones did incorporate this technology however it was sometimes limited to only part of the screen and required the use of a pointer or pen which usually got lost or broken. The speed of this phone also amazed me, not only do the applications load and run very smooth and fast but surfing the web is also allot less frustrating than it was on my old mobile phone. Connectivity is fast too, attempting to use GPRS location services on my old phone was almost imposable, it was faster to ask directions. The HTC desire locates satellites and locks on to your position within seconds of exiting a train station, it dissent matter how you hold it either and the Google map application quickly shows your location, enter your destination and simply follow the directions. It features voice guidance and drive view too. The only bad thing about this is now my car Satellite Navigation system is redundant. Well not strictly truly hardware but generally with older phones you were stuck with the phonebook management program or message handling feature, it was part of the firmware of the system and could not be changed, the HTC Desire however allows you to download different programs or applications to manage these features. 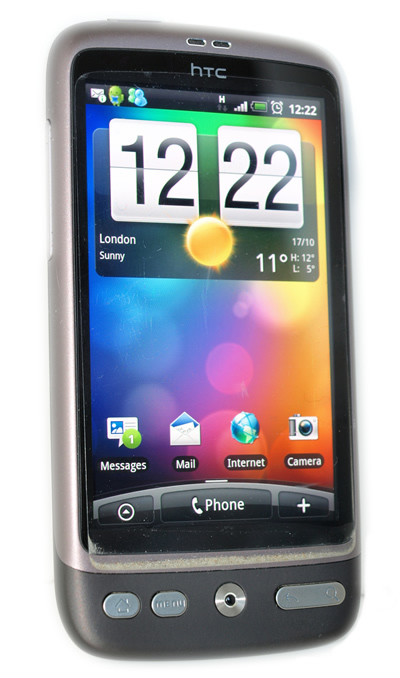 The HTC Desire contains a number of great sensors such as a G Sensor, Digital Compass, Proximity Sensor and Light Sensor. These allow your phone to be turned into gadgets such as a light meter, compass, speed and shock sensor, metal detector and star locator. Probably one of the most amazing applications I have installed is Google Sky Map which somehow displays the complete night sky very accurately relative to your exact location. Now I am not really a star gazer but we all find stars wonderful to look at, now you can hold your phone up to the night sky and identify any star you can see, and many you can’t, including every planet known to man. The inbuilt G Sensor and Compass also allows the phone to be used as a motion controller for games and it is also put to good use by sensing when you pick the phone up by muting the alarm or ringtone. Now the fact that the HTC Desire uses software that is not governed by bureaucracy and legal restraints it means that there is no shortage of programmers developing applications. Previously software developers would only write programs that were considered commercially viable now anybody can have a mad idea and write an application to achieve that. The Android operating system is not new either so geeks have been experimenting with this system for years. This gives way to a vast library of millions of free and paid for apps some useful and some no so but mostly all quite cool. Some less useful but cool applications I have installed are an iLighter, heart rate monitor, lie detector and the ability to load up a display not dissimilar to what you might see in a star ship or fighter aircraft which displays my speed, heading, pitch and role (useful for off road). Some of the more useful applications I have installed include a barcode scanner which allows you to check process online while shopping for that bargain, news and weather applications, a torch which uses the super bright flash led, a custom camera that allows control of functions usually only found on a digital SLR camera, voice search and a scientific calculator that can also count in Binary. This is usually a feature used to sell a phone, after all who wants a phone that you are unable to update your Twitter or Facebook status? This phone makes it a breeze with a choice of hundreds of applications to manage any social network you may be a member of. You can even update your Wordpress blog. Most social networking applications make very good use of the phones inbuilt location services connecting you with people and information relevant to your location. Lastly probably the most useful feature is the preinstalled browser is Flash compatible ensuring unlike its main competitor you do not miss out on any website content. People tend to buy what is hip or trendy at that point in time whether it is the best or not is irrelevant. At this moment in time that includes anything with an “i” in its name. I would personally urge you to consider an Android phone for all the reasons mentioned here and many many more I simply don’t have time to mention. Are their any bad points? Now I did personally expect more from the alleged super bright AMOLED display. This was reported to have minimal glare and be highly visible even in bright sunlight. Not quite so true, it is certainly much brighter than any other mobile phone display I had previously seen but I found I still struggled to see the display in bright sunlight and I also discovered when I nearly blinded myself, it had an undisclosed function as a signalling mirror. I could see women would find this feature useful for applying makeup on the tube. One thing in my view the manufactures have not considered is that it will actually be used to make phone calls and send text messages. Oddly the unusual phonebook and message log applications are totally unconventional compared to the format we have all previously been used to. Oddly the phone book defaults to SIM and Phone Contacts view simultaneously making editing phone book information a little confusing for the new user. Messages are automatically grouped by telephone number or contact name rather than by date, it is also a little awkward deleting only one message without deleting every message from the same contact. To begin with I found typing text via the screen was difficult and frustrating at times, a friend with larger than the average size fingers struggled considerably, sometimes a button can be pressed when you are not actually touching the screen and often you hit the wrong key. I did find however running the screen calibration program reduced the chances of pressing the wrong letter almost to zero. Now one thing I am still struggling to get my head around is the fact that most apps do not have a close or end button. Apparently the Android can manage your apps far better than you could and thus an end, stop or close button is not required. That fine for apps that behave but when you have an app that automatically starts when the phone starts up and it persistently plays notifications in the dead of the night an end button is something you desperately need. Also unless you are a very experienced user I would deter you from installing third party apps or apps not in the Android Market as these are the ones that do tend to play up a little and as yet I have not found out how to uninstall apps not listed in the download directory. Oh lastly I should mention as with any modern day mobile phone the battery life deteriorates rapidly especially if using Wi-Fi and GPS. Mobile phone batteries continue to advance in a manner that allows them to become smaller and smaller but oddly they don’t actually last as long as they once did when your old brick phone only needed charging once a week. Again a perfect example of how we prefer our products to look good over functionality. Would you buy a three inch thick mobile phone? Higher capacity batteries are available for the HTC Desire but to keep cost down and maximise manufactures profit the Desire is shipped with the standard low capacity battery. I’m sure additional revenue could be obtained offering purchases a high capacity battery option from first sale. The outstanding features on this phone far out way the minor faults. I only rate this phone 99% because I know technology can only get better. I have had one of these phones for a while now and like you it continues to astound me with its capabilities. My Sat Nav is now redundant. I can watch TV on it, use it as a wireless access point, monitor earthquakes, check my heart beat, the weather forecast and update all of my social networks at the same time.